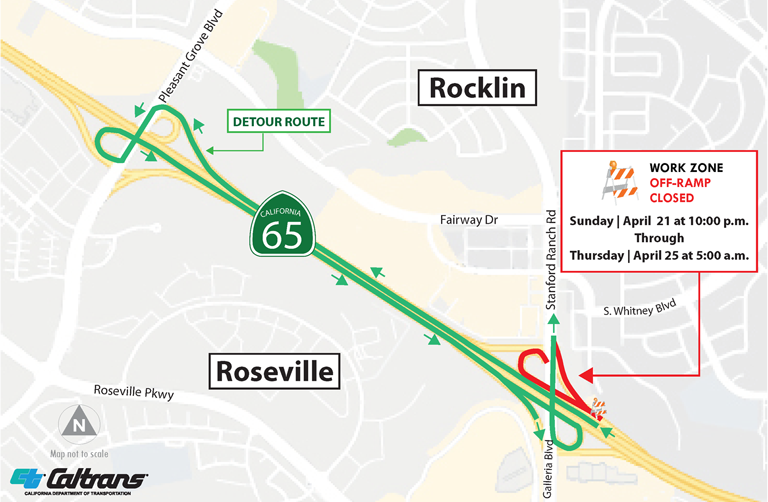 Caltrans work on the Highway 65/Interstate 80 Interchange Improvements Project will temporarily close the northbound Galleria Boulevard/Stanford Ranch Road off-ramp, 10 p.m. Sunday, April 21 through 5 a.m. Thursday, April 25. The schedule is subject to change due to weather conditions. Follow detour signs (see map below) or choose an alternate route. - Take the northbound Highway 65 exit to Pleasant Grove Boulevard. - Turn left onto westbound Pleasant Grove. - Take the freeway entrance to southbound Highway 65. - Take the southbound Highway 65 Galleria Boulevard/Stanford Ranch Road exit. The work is part of a $50 million Interstate 80-Highway 65 interchange improvement project that will add a third lane on northbound Highway 65 from Interstate 80 to Pleasant Grove Boulevard and make other improvements to the Galleria Boulevard/Stanford Ranch interchange. Learn more about the improvements by visiting 8065interchange.org.